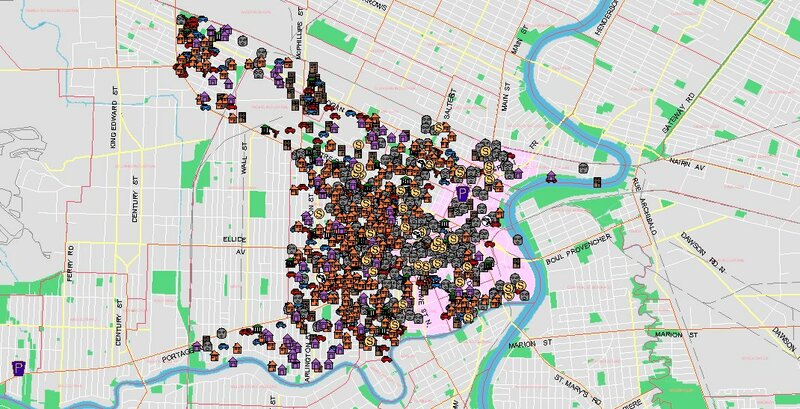 There is a problem with the crime maps displayed on the Winnipeg Police Crimestat site. Your filter selection returned 2060 incidents. You are viewing the first 1000 crime incidents on your map window. Click on ‘view report ‘for complete crime incident details or refine your filter criteria further. The Crimestat map for District 1, the downtown area for the period of January 1st to November 25th 2011, displays only the first 1000 incidents reported in 2011 (Map 1). Because the first 1000 incidents took place between January 1st and June 24th 2011, a search for those dates will display the same map, the same 1000 incidents. If you want to see a map that depicts the crimes committed between June 25th and November 25th 2011, you will need to draw up a separate map. It will show the additional 1038 crimes not shown on the first map. Map 2 displays those incidents. Although the maps appear virtually identical, i.e. the crime pattern as largely unchanged, subtle differences can be noted. In order to get a true view of crime in the downtown area you would need to be able to combine those two maps but the system does not allow that. The same limitation applies when you request a map for any geographical area that has more than 1000 reported incidents. When you draw up the city-wide map (8509 incidents reported between January 1st and November 25th 2011) the map only displays the first 1000 incidents. Imagine what the maps would look like if you could see all incidents of reported crime! This entry was posted in Crime and Statistics and tagged crime maps, crimestat, Winnipeg police. Thanks for this. Crime stat should be an excellent analytical tool. Unfortunatly it does not include important inner city crimes. We would need four different maps to see the actual crime incidents. Wow, nice hit Menno. And Sel, is there somewhere I can contact you to follow up on your comment? Sel: I agree. The crimes currently listed on Crimestat were intended to be the starting point when Crimestat was first introduced. The Police Service is not limited to the crimes currently there. The number of crimes being tracked could be expanded but the Service has chosen not to do so. Thanks for setting the record straight,,, these guys are worse than mafia accountants !!! Analytical tools are usually designed with some objective in mind and usually for the use of skilled analysts. What were the objectives behind creating Crime Stat. To assist the Police in developing crime suppression strategies? To assist the public in avoiding possible victimization? To provide an accountability mechanism (ie. provide ammo for WPS critics)? If these were the objectives I’d be interested to know if any successes have been achieved. If Crime Stat’s sole value has been in holding the WPS accountable I’d say it was a big waste of valuable resources and should be scrapped. Doesn’t the CCJS UCR still exist? Crimestat was intended to be a Service wide approach using up to date crime data as a basis for directing police operations in an intelligence led manner. It was patterned after Compstat, first introduced by the New York City Police Department and subsequently adopted in many other major American cities. The Crimestat website, which is the public face of the program, was intended to achieve several outcomes. 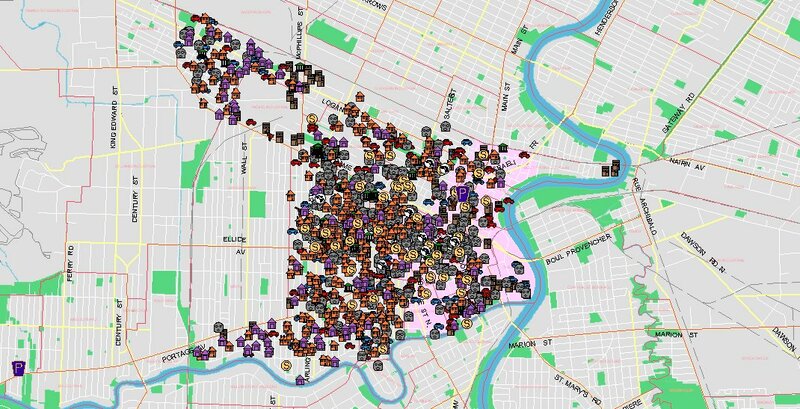 It provides an up to date picture of crime in Winnipeg and can assist citizens and businesses in taking precautionary measures in situations where a crime trend is developing in a particular area of the city. Secondly, it serves as an accountability mechanism in terms of how well the police are performing. Although public accountability was an important objective the primary objective for the police service was crime reduction. Although there are other crime data sources, Crimestat data is much closer to real time. The Winnipeg Police Annual Report for example was released 11 months after the year end last year and the 2010 report is yet to be released. As opposed to scrapping Crimestat I would urge that it be used as intended. Used properly it is a proven model for crime reduction. You can see the full year on the crime stat map if you do the search by neighbourhood, instead of police district. But the crime stat map is virtually useless in showing crimes in an area when stabbings, assaults, and arsons are not included. It is also too bad that the information is stored for only one year, and comparison information only shows one year previous. “The same limitation applies when you request a map for any geographical area that has more than 1000 reported incidents”. If you select a smaller geographical areas such as a neihgbourhood, that has less than 1000 reported incidents the limitiation does not apply. I agree that the crimes being tracked need to be expanded to include those mentioned and a few others as well. The Crimestat process cannot be applied to crimes or occurrences for which there is no data. The data accumulated since the inception of Crimesat in 2007 should be available on the site. District One is not the Downtown. The Downtown is part of District One, as are several other non downtown districts, which are the inner city, where no-one visits, other than the local residents. Is this why there is such a disconnect about crime and the downtown? I’m not certain if there is a disconnect about crime downtown. Everyone other than perhaps the Stefano Grande and the Mayor agree there is a crime problem downtown where ever or what ever it may be. I believe according to the City the portion of District 1 highlighted in pink on the Crimestat map contitutes, the downtown. Phoned WPS today. I was told the the Downtown Division 1 includes several neighborhoods in the Dan. Mac and Point Douglas wards. I am suprised you did not know that. Yet, you just said the pink area is the downtown, and not Division One? Seems to me your misleading people. Are you saying when you were acting as interim police Chief the BIZ never talked to you about downtown crime and that the BIZ did not ask for more police officers? I would like to see you and the BIZ go head to head on CJOB, that would be juicy. I will attempt to address your concerns but it may take a few lines as you seem to be seriously confused. Firstly, for police operational purposes the city of Winnipeg is divided into 5 geographical areas called Districts. The police service (internally) is divided into work groups called divisions. A division consists of the people and resources that provide police services in a particular area, either service within specific geographical area, or in a specialized field on a city wide basis. In District 1, police services are provided by personnel assigned to division 11, in District 2 by personnel assigned to Division 12 etc. The Homicide Unit would be an example of a specialized work unit that provides services on a city wide basis. The most northerly portions of District 1 falls within the Point Douglas ward, the western portion falls within the Daniel Macintyre ward, and the southern eastern portion falls within the Fort Rouge-East Fort Garry Ward. Each of those electoral wards has some neighbourhoods that fall within what has been identified as the ‘downtown’. I’m not certain what caused you to conclude I did not know that. I worked in that system for almost 35 years and can assure you that I understand the geographical and political boundaries. To address the issue of what the terms District 1 and the downtown mean let me say this. The Crimestat map clearly outlines the boundaries of District 1. Falling within the boundaries of District 1 is a smaller area designated by the City and the Downtown Biz as the ‘downtown’. This area designated as the ‘downtown’ is roughly equivalent to the pink portion of the Crimestat map. In order to clarify matters in a statistical sense I have suggested to the city that an additional geographical area encompassing only the ‘downtown’ be created on Crimestat to facilitate crime measurement in that area. So far they have declined to do so. In terms of your other points which were not directly related to this post let me say this. The Downtown Biz has lobbied the City and the police department requesting more police resources for the ‘downtown’ area for many years. That is their job. They are a lobby group representing the interest of downtown business owners who fully appreciate that high crime rates are not good for business. In terms of a debate with the Downtown Biz, it might be less juicy than you think. Their goal as I understand it is to make the ‘downtown’ safer. I support that. So when WPS talk about violent crime in the Downtown, they are referring to District 1 called the “Downtown” by WPS, which is not really the Downtown as identified by the City and the Downtown BIZ. F’ing confusing. That explains much. I do like your idea of suggesting to the city that an additional geographical area encompassing only the ‘downtown’ be created on Crimestat to facilitate crime measurement in that area. So far they have declined to do so. The media needs to pick up on this and get to the bottom of the story when it comes to downtown safety. Right now is dam confusing when the media say a crime downtown has taken place, and its on Furby, which is the West Broadway, and not the downtown.